I received my Diana F+ in the mail today. Boy, they aren't kidding about it being a cheap plastic camera. It is almost amazing that anybody can take great photos with it, if it were not my experience that photography is more about skill than the camera. 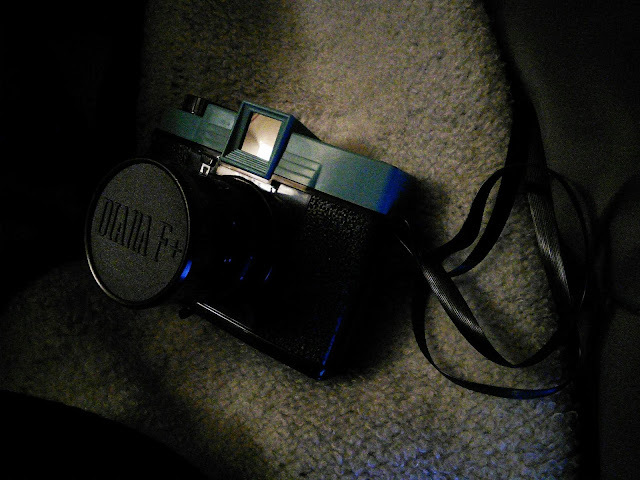 In any case, I am excited to have my first medium format camera. More than anything, I wanted to experience medium format photography. I have been shooting on 35mm, which I picked up after learning on digital. I realize that the clarity and other high quality benefits inherent with medium format are undone with the lo-fi nature of lomography. But, what I am after is the experience of shooting, getting developed, and viewing prints from medium format film. With 35mm, my first limitation was developing black and white film. There are no local labs able to develop it for me. This is how I discovered lomography; I was searching for a photo lab that would take orders by mail. This also gives me an opportunity to try new films, to go beyond 35mm. I took a few photos with the new Diana F+, but will wait. Today's weather is wet and gloomy. I took a photo in the rain; but rushed right back inside to avoid getting too wet. Having to send off the 120 film forces me to be patient. Thus, I will have plenty of time to shoot. No rush. Replacing Evernote With Google Keep and Now?